A high proportion of ovarian cancers from women who carry germline mutations in mismatch repair (MMR) genes demonstrate microsatellite instability (MSI). The utility of pre-screening ovarian cancer specimens for MSI to identify potential patients for germline screening for MMR mutations is uncertain. 656 women with malignant ovarian cancer underwent both MSI testing and germline mutation testing for large rearrangements in three MMR genes, MLH1, MSH2 and MSH6. Germline DNA sequencing data for the same genes was available. Among the 656 women, only four (0.6%) carried a clearly pathogenic MMR mutation. All four cancers from patients with mutations had loss of two or more microsatellite markers (MSI-high). Eighty-four of 652 (13.0%) women without a mutation had MSI-high ovarian cancers. Using MSI-high as a prescreening criterion, the sensitivity of MSI testing to identify germline MMR gene mutations was 100% and the positive predictive value was 4.5%. Germline mutations in MLH1, MSH2 and MSH6 are rare among unselected cases of ovarian cancer. 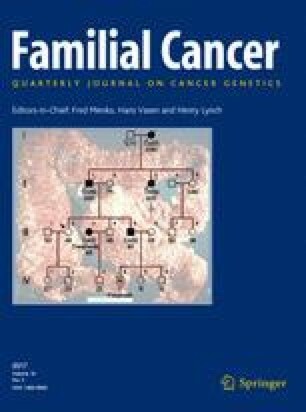 Patients with germline mutations often will have MSI-positive cancers and pre-screening of ovarian cancer specimens may be an efficient way of identifying patients with Lynch syndrome. Mohammad R. Akbari and Shiyu Zhang are Joint first authors. Financial Support: Supported by grants R01 CA111914 (TP), K07 CA108987 (TP), R01 CA063682 (HAR), R01 CA063678 (SN) and R01 CA080978 (SN) from the National Cancer Institute. The author’s declare no conflict of interest.